Most of us have only a very vague idea of what the Earth looks like. Asked to draw a map or describe its species, we get as far as the continents and a few notable countries, or our own particular areas of interests. 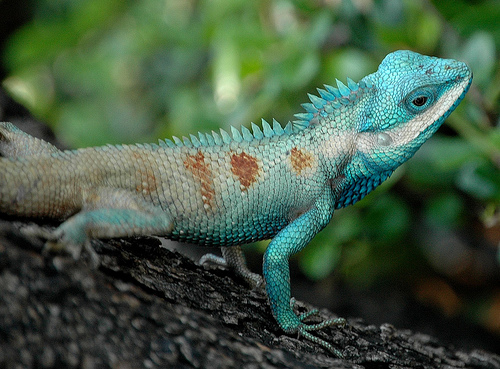 We know lions and tigers and bears, but the shrews and tree lizards are largely obscure to us. This is not surprising: Earth is big. Really big - six billion people. You can't get the human race into a 32 bit number - we're that numerous. 150 million square kilometers of land, more than twice that of water. It can take a lifetime to garden one hectare, and each square kilometer has 100 of them. The species are innumerable, just under two million counted, and many more living unnamed by science, hidden from our conscious knowledge. When this is gone, there are no more of these. You're looking at the face of a little animal, but there are so many of these - not just so many individuals, but so many species it's impossible for us to keep track of them or even to understand their innumerable diversity and variety. The world is too big for us to fit inside of our heads. Too much area, too much landmass, too many people, too many kinds of things, too much detail and complexity in how those things work. There is no possibility of a human overview which is correct, comprehensive, clear and actionable. We just cannot really grasp the world as it is. To cope in the past we have applied three fundamental approaches beyond ignoring the complexity and size of the planet. The first is division of labor: we divided up reality into subjects and geographies and each tried to master a subset of the whole. A lizards-of-north-eastern-Sumatra expert and a set theorist each catalogue their corner. The second approach is the recorded word: we write down that there are small green lizards with latin scientific name, note their habits and habitats. Within our scientific and technical limitations, this is what we could do, and we did it. The final approach is the destructive one: we counted things and called it knowledge. What does 1.8 million species mean? If you try and name as many kinds of birds, plants and animals as you know, perhaps your list would be 200 or 300 items. If you were a specialist, perhaps a few thousands. 1.8 million species is so many it would take thousands of people just to remember all the names. A recitation of the list read aloud would take a year. Six point five billion humans. Just to read their names would take a thousand years. But still these unimaginable numbers substitute for real knowledge. Dropping from 1.8 million of something to 1.2 million of it - what does that mean to us? Online, when we are interested in a thing, we can examine it in more depth quite easily. One term for this is drill down. You think Sumatra, and work through Wikipedia and Flickr and Youtube until you have a sense of the place, then hit academic papers and travelogues and so on. It's not substitute for going there but it is a fairly comprehensive overview of what a visit there might be like, at least in the abstract. Let me introduce you to somebody. Hansabai is a village elder in Karamta Village, Kutch province which is in Gujurat, India. She's standing beside a well she helped arrange financing and engineering for in collaboration with local groups. 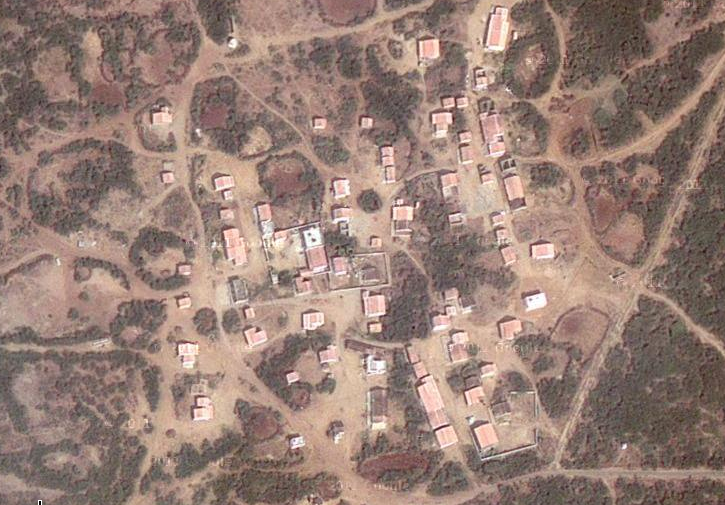 Here's a satellite map picture of her village. Right now, in India, in Gujurat, her and her village and her well continue their daily lives. She is not nobody, she is somebody because we know where she lives, what she did, and how to find her. Right now she doesn't have a blog, but in a few years, her and millions and then billions like her will. She'll have Flickr and Twitpic or something equivalent because phones are cheap and everywhere and increasingly capable, and people everywhere love these tools. You might not know her language, but maybe her friends will translate or she'll learn a little English - or you'll pick up some Urdu! We have these pictures and know her story because of a social network. Some parts of that social network are business - Mark Charmer, who went to Karamta and took the pictures is one of the founders of Akvo is a water knowledge and fund sourcing NGO which works with Argyham which is an NGO in India. I know Akvo through Global Swadeshi and work with them. I know Alfie through Lloyd Davis and the Tuttle Club. And that's how you get to see this lady and her village and know a little about her well. The story has travelled to you across the network, both physical and social. I want you to stop and think for a moment. Is this a statistic? No, not at all. It's a little snapshot of a single facet of existence, a moment of narrative reality. There are billions of these moments online - blog posts, tweets, mailing list messages, facebook status updates, all kinds of things. This lady and her well are remarkable to me because she's not a middle class technical professional tweeting about her coffee. She's different from me and therefore inherently interesting. Drill-down is very different from merely compiling statistics. Statistics abstract away the story and remove the human context which makes life feel real. The primary data from which the usual statistics are created can be preserved, giving access not just to the aggregate situation and context, but to the very source material itself. Access to the factual reality from which the statistics are usually compiled changes our whole relationship to the situation, because we can drill down and find the people who are the story behind the statistics. Would you like to know her a little better? Here is a five minute video of her discussing her well project with the team that helped implement it. Now, would you like to talk about world peace? About unity? About all working together and sharing to make this a better world? I don't want to sound naive and optimistic but I think we finally have the tools and the technology and the culture to really make some changes here. To really step into a new age of international development and cooperation between people to improve our lives. And I don't mean this in some sense that leads to heavy cultural protests about government priorities. I don't mean an abstract solidarity funneled and channeled through organizations the size of nation states. I mean direct knowledge of what is happening on the other side of the world, more or less in real time, and learning to know the world not through dull, dry statistics, but in as much of its human vibrancy and reality as we can manage. We're all just people, persons in our own lives and minds and communities. This combination of international friendship - cross-cultural knowing - and drill-down using tools like mapping and stories that reveal themselves as you focus on - this is revolution! The tweets turn into the blog posts turn into the maps and the video and the knowing, moment by moment, and day by day, how your friends all over the globe are doing. We are probably a few years out from this lady and her friends all having microblogs. We are a little ways out from visible, tangible international social development networks moving onto social media as a way of displaying the state of things in a way which allows people to work out how to collaborate and help each other. But it is coming, very soon and very fast, and this is the new face of international development. It is as personal as friendship, as fast as light, and as deep and deeper than the problems of the world. You might think that the problems of the world are insurmountable - that there is not enough to eat, enough water to grow food, that the sky is on fire and falling fast. It is not like that at all. There are really good solutions for the vast majority of the development problems of the poor. Most of these problems are in the general fields of infrastructure or agriculture. Infrastructure is a funny beast. It is not something we talk about all that much, although in one way or another many of us internet professionals are information infrastructure builders. Physical plant - hard infrastructure - is what our grandparent's and our grandparent's grandparent's generation did. When Victorian London had terrible problems with cholera they tracked it down to sewers and wells being too close together and fixed it with huge municipal plumbing projects. Light and heat followed by gas and electricity, and pretty soon the shape of the modern city we know today was set. Right now in the developing world these kinds of hard infrastructure problems are where most of the damage is being done. The deep problems are easy to define: the absence of toilets and clean drinking water, the smokey cooking fires and lack of mosquito nets. The fundamental public health tools are missing. No electrical light at night means no school after working in the fields all day. On the agriculture side, there are economic issues like inefficient use of land. However, many of these problems can be solved with knowledge. More effective farming methods, notably including organic agriculture, have the potential to nearly double food production in the developing world. Yes, some improvements to living standards require capital - a few tens of dollars per household is typical for many fundamental improvements, like wells and toilets - but many do not. A typical no-capital solution is something like SODIS - solar water disinfection. In sunny areas, one can place river or pond water into a plastic soda bottle and place it in the sun, perhaps on a sheet metal roof. Over the course of a day, the combination of bright sunlight and heat kill all or nearly all of the organisms that would make you sick if you drank the water. In the rainy season, when the sun is not so reliable, you can drink the rain water instead. Put these two techniques together and you have much safer drinking water for hundreds of millions of people. On the agriculture side, it comes down to techniques like green manures, which are fertilizer crops planted before or after food crops. They enrich the soil and support yields in future years. If you add capital a whole new range of tools opens up. Toilets like the Sulabh toilet cost ten dollars or a bit more per household. A village might require a few thousand dollars to provide for everyone, with enormous public health benefits. Akvo's main focus is on enabling the poor to get access to the small-scale capital investment that they need to implement this kind of low-tech water infrastructure. The goal is to streamline the process of funding these kinds of small-scale water and sanitation projects using the internet to manage grant matching and project reporting. So far the results are extremely promising. From improved public health comes better economic performance, because people can work more consistently on their land and in their trades. None of these solutions produces much, if any, additional environmental impact - in fact many of them radially reduce problems like deforestation. As living conditions improve, birth rates drop as has been seen in the developed world and the more prosperous and stable areas of the developing world. As the network builds out, as tools like Appropedia and Akvopedia help connect people to the knowledge they need to implement these basic welfare technologies. We are at the earliest stage of communicating these living systems internationally. The research and development has gone on over the past thirty or forty years, resulting in a plethora of reasonable candidate technologies in water, sanitation, cooking, agriculture, health care and so on. Many under-funded, under-resourced groups rush and struggle to filter the candidate technologies and select the best ones, document them and translate the documents into local languages, make films to help communicate what cannot be written or read effectively, and generally provide resources to the people who need these tools themselves, and the many volunteers and development groups that seek to help them. We are in a position similar to GNU/Linux in 1994 or so. There is a basic tool chain that works for some classes of problem, and has the potential to be used globally and expanded and refined to handle much broader classes of need. A combination of individuals and organizations are working in loose collaboration to extend the reach and situational fit of these appropriate technology solutions to the basic infrastructure and agriculture problems of the poor. As the hardware platform for information dissemination spreads, and cultural acceptance and understanding of these systems increases, there is a very real potential for an alternative development path to take root all over the world, in which services are largely provided locally using open source appropriate technology solutions rather than large Victorian-style industrial sewage, water and power systems. Although I do not want to over-stress the parallels between open source software and open source appropriate technology, the fundamental conditions that support these technologies are very similar. There is a rapidly growing network - just over half the human race has cell phones now, and the rest will be online within 10 years. The network and hardware platform make information exchange about solutions possible. Training and education materials are developed internationally, providing low-cost solutions for all. The difference between hacking on a Linux kernel and figuring out a rope pump implementation question - if you have access to a network and people with expertise to support your work - is really not all that large. The commodity hardware - whether it is a cheap computer, or some bits of car tire and washers and a wheel and a rope - is used to solve the problem at hand using knowledge from the network. And there is no shortage of people to research and extend global knowledge in these areas: there are five times as many incredibly smart people in the poor parts of the world as in the rich ones, simply because there are five times as many people. As they begin to come online in the next few years, the collective intelligence of the human race is going to increase by a factor of five. Nobody knows what this means yet, but I'm very hopeful that it is going to enable us to think our collective way out of all kinds of problems that currently look in surmountable. I call this whole approach to development the "soft development path". It is ICT and open source heavy, and capital and infrastructure light. I think it is reasonably clear that all of the technologies exist to allow people to enjoy essentially first-world standards of public health and education using relatively limited material resources. It is the only approach I know of to international development - or the future of the human race - which allows everybody to live a good life without destroying the planet in the process. By decoupling personal welfare with economic growth, we become able to provide for everybody. The example of Kerala in India proves that under the right conditions it can be done even without broad-based use of advanced appropriate technology options. The additional leverage of internet-supported appropriate technology roll-out opens up the real possibility of a world in which all people can enjoy a good standard of living, with long life, abundant food and good health, without requiring us to solve many of the apparently intractable political problems which have plagued the global economy and particularly international development over the years. That we share one world is most visible not from space, but from the simple fact that many of us know and collaborate with people all over the world. As the cell phone and internet converge and globalize, putting nearly everybody online, our ability to work together internationally - to know each other's lives - is going to explode. Open source appropriate technology offers a way to turn this massively increased connectivity into real, practical solutions for drinking water, sanitation, food production, public health, cooking, heating and nearly every other area of need. Social media is how we operate in this networked environment. These are the fundamental tools of conversation, collaboration, coordination and celebration - the new C4I." As everybody becomes networked thanks to the global spread of cell phones and the convergence of the cell phone and internet, everybody is going to use social media to meet their needs. Those who need water will collaborate using social media to research and implement water solutions. Those who just need to know where the party is will continue to use social media to find it. Right now, I work with Akvo, which is working on helping groups all over the world use the internet to find the knowledge and funds they need to implement village-scale water and sanitation projects. What I've learned at Akvo is how important our cultures of cooperation are, and how much seeing people's lives in all of their richness is a part of building the social web which underlies all communication of mere knowledge. We have an outline of the technologies which have the ability to bring water, sanitation, food and every other needful thing to all of the people of the world, and now what we need is to build out the social structures and conversations which will support that process over the next two decades. By the time I retire in 20 years, I believe that poverty that people die of will be a thing of the past. If you do not think that is possible, I ask you to think on this question: if the Linux nerds had needed to learn to grow food and build wells, do you think they could have cooperated to figure it out and implement it everywhere it had to happen? I think the answer is yes, and that means that as the internet arrives in the developing world, all needful things will come with it in a few years, through the magic of human intelligence and friendly cooperation.